Click on the box to reveal the answer. HELP! I need a voice over/voice actor TODAY. Don’t worry. I put this up at the top for a reason. Call me right now at (+1) 612-524-8758 or email me at John@VoiceOverGenie.com. If I miss your call, leave your info and explain your audio emergency. Then send me an email with your script, budget, and any read directions you have. I’ll respond ASAP and we’ll solve your problem. Can I hear you record a demo audition of my script? I’ll record it and get it back to you within 24 hours (usually much sooner). Do you have experience with my specific kind of project? Yes. I record 98% of my work in my private, acoustically treated recording booth. I’ve recorded voice overs for AT&T, Dreamworks, Porsche, A&W, Jockey, and hundreds of other clients in this booth. You’ll love my audio quality, too. Do you edit the audio, too? Definitely. At an absolute minimum, each recording file you receive will be crystal clear, error-free, final project ready audio (unless you specify otherwise). Just tell me what you need (editing level, file format, etc.) and we’ll go from there. What's your average turnaround time for voice over projects? Fast. 24-48 hours (if not sooner) for most projects but each project is different. Regardless, I will do whatever I can to beat your project deadline. Great question. Answer? Totally depends. 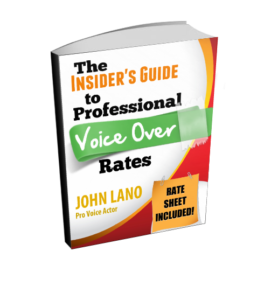 I wrote an in-depth, insider’s overview of voice over rates HERE. It also includes a copy of the rate sheet I use every day. Can I hear some examples of your voice work? For sure. I’ve gathered a bunch of my recent projects for you to hear and watch. I recorded most of these in my private recording studio. You bet. I have 3, actually. If you’d like to hire me through an agent, head over to my contact page. You’ll find all of their relevant info at the bottom of the page. Are you a union or non-union voice actor? Really good question. Currently, I am non-union. I won’t bore you with all the details, but that’s probably good news for you as it gives us a lot of flexibility. Can I direct the recording session remotely? Yesss. I love directed sessions. Many of my clients prefer it, actually. Do you have a phone or Skype? You can connect directly through my microphone with either of those options. Do you have ISDN, Source Connect, or anything like it? I have very good relationships with several studios just a few minutes away from me who are equipped with ISDN, Source Connect, and everything else in between. And because I have such a good relationship with them, I can often negotiate a discounted rate for their studio time. While I record projects for clients all over the world, I am actually located in Minneapolis, Minnesota. I love this place. Are you in my neck of the woods? I’d love to meet you. I do have a question but it's not answered here. I’m sorry about that! Send me a quick email to John@VoiceOverGenie.com with your question and I’ll answer it ASAP. If I don’t have the answer, I’ll find someone who does.